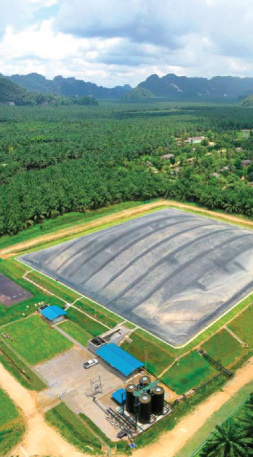 Standing beside a palm oil wastewater lagoon can promote a vague sense of unease. The murky brown surface appears more molten than aqueous, blanketed in roiling bubbles that suggest the imminent emergence of a mythical beast. Plus, it stinks. Thousands of these lagoons are spread across the tropics, and the number is growing steadily. Should you find yourself beside one, the bubbles you will see are indeed the product of subsurface life. But it’s not a hidden monster. Instead, untold trillions of microbes (and perhaps a few crocodiles) chew threw the waste stream. Each bubble is full of methane gas, leaking from these lagoons at staggeringly high rates. Toss a match onto the foamy surface and it might burst into flame. After carbon dioxide, methane is the leading cause of a warming planet. Recently, in a paper in Nature Climate Change, we showed that the methane produced by a typical palm oil lagoon has the same annual climate impact as driving 22,000 passenger cars. With well over a thousand (and counting) palm oil processing plants now in operation, palm oil wastewater methane emissions account for more than one-third of the warming potential of greenhouse gas release from rainforest and peat swamp destruction in Malaysia and Indonesia, where 85 per cent of palm oil is produced. Already, palm oil methane leaks are equivalent to nearly 10 per cent of the amount of methane arising from global natural gas production and transportation. As the industry moves toward intensification rather than land expansion, the relative importance of wastewater methane will only rise (intensification practices that drive higher yields will ultimately create richer wastewater, and in turn, more methane). Palm lagoons leak huge amounts of methane because they are the narrow end of a funnel. Just as a watershed can focus a county’s worth of rain through a river only a stone’s throw wide, vast palm plantations harness some of the highest rates of plant productivity on Earth and push it through a single processing plant. Much of it becomes everything from toothpaste to Tater Tots. The rest goes into those lagoons. And as with any wastewater treatment facility, the lagoons are designed to break down huge amounts of organic matter, most of which becomes methane. On a large scale, that’s bad news for the climate. This is all just the cost of doing business, right? Well, maybe not. The very features that create high wastewater methane emissions add up to a largely unmet opportunity: concentrated methane is energy for the taking. For any given palm oil mill, all you need is a roof on the lagoons and a biogas generator next door, and the climate impact is reduced 34-fold while enough new power is generated for tens of thousands of rural households. Biogas technology is decades old, and often used at wastewater facilities in the US and Europe. We know how to do it, and it works. Yet fewer than 5 per cent of the world’s palm oil mills have biogas capture systems, because, for most plants, it’s not worth the investment. Wastewater methane could power the palm oil mill itself, but most already harness solid waste streams for bioenergy. Sell power to the grid, and up front investments in biogas facilities can turn a sizable profit within only a few years — but many plantations are too remote for current grid access. And for mills close to the grid, reliable power purchase agreements and feed-in tariffs fairly adjusted for fossil fuel subsidies can be difficult to acquire. Most tropical nations lack innovative energy policies that can integrate distributed, small-scale renewable energy (with Thailand and Brazil being notable exceptions). And even though biogas facilities can turn a profit, the financial returns often pale in comparison to those expected from core business investments such as land banking, boosting yields and plantation development. Wastewater methane emissions from palm oil plantations are a growing contributor to climate change. But they could be turned into renewable energy with existing technology, like this biogas power system in Thailand. Photo courtesy of Univanich Palm Oil PCL, via Ensia. Still, there are ways we might see faster adoption. Higher valuation of CO2 emissions in carbon markets would help. From 2008 to 2011, carbon was trading well above $10 per metric ton, and palm oil mills were able to finance methane capture systems through carbon revenues via the United Nations Clean Development Mechanism. Adding energy returns just made the deal sweeter, resulting in the first wave of biogas facilities throughout the industry. But when the price of carbon plummeted, biogas development largely evaporated. In lieu of attractive carbon prices, pressure to “green” corporate supply chains could make a difference. Forward-thinking companies are already moving quickly to cut greenhouse gas emissions in an effort to reduce carbon risks and improve financial returns. For the most part, mitigation efforts have focused on emissions from operations — what are known as SCOPE 1 and 2 emissions. But most greenhouse gas emissions tend to occur in supply chains — what are known as SCOPE 3 emissions. Green those, and you start to make a real dent — and maybe turn a profit at the same time. Take Unilever, which uses about 3 per cent of the world’s palm oil for its household product brands. The company has taken bold action in reducing carbon-producing deforestation within its supply chain — but its supply chain methane emissions are on par with the fossil fuel–related emissions of Cambodia or Uganda, with palm oil methane emissions approximately double companywide SCOPE 1 and 2 emissions, and nearly four times the total emission reductions achieved from improvements in manufacturing and logistics operations from 2008 to 2012. This same story plays out for many other household corporations, including Proctor and Gamble, Walmart, Kraft, Nestlé, Cadbury, the Hershey Company, McDonald’s, PepsiCo, Colgate, General Mills and Kellogg’s. SCOPE 3 emissions largely fly beneath the public eye. If Unilever converted its methane waste to energy, it could provide renewable power to over 1 million households in rural Malaysia and Indonesia, where most of its palm oil is sourced. Each facility would cost roughly $3 million to $5 million, and typical return on investment would vary from 6 per cent to more than 20 per cent over the lifespan of the project. Already, Unilever is capturing energy in waste: 30 of its 252 manufacturing sites have biomass-based power, which generate 7 per cent of its energy consumption. The same could happen for wastewater methane. Until market demand rises in India and China, the other half of the sustainable palm oil produced will be sold at conventional rates, creating a disincentive for growers to invest in the certified product. It’s much harder to push a chain than pull one. Meanwhile, consumer pressure has begun to make a dent in palm oil greenhouse gas emissions. Recently, Unilever signed a commitment to stop carbon-emitting forest destruction with its supplier Wilmar, which controls 45 per cent of global palm oil production. This comes at a cost for Wilmar, since most rainforests are still worth more dead than alive. Another palm oil giant, Golden Agri Resources, also recently committed to zero deforestation across its supply chain. Similar pressures and policy instruments could help catalyze biogas development. It’s expected that the Roundtable for Sustainable Palm Oil, members of which sell deforestation-free products, will require methane mitigation for certification sometime in the future. The RSPO has been instrumental in bringing sustainable palm oil to market, but while in the US it can seem as though the organization is making a difference, it’s not especially influential on a global scale. RSPO-certified palm oil has plateaued at 15 per cent of market volume, and only half of it is being sold at higher prices that would justify the costs involved in creating a certified product. Until market demand rises in India and China, the other half of the sustainable palm oil produced will be sold at conventional rates, creating a disincentive for growers to invest in the certified product. It’s much harder to push a chain than pull one. Encouragingly, the Indonesian government launched the Indonesia Sustainable Palm Oil initiative, making it mandatory for palm oil firms operating in Indonesia to make efforts toward installing biogas capture systems. Yet, making efforts doesn’t translate to installation, and (for good reason) wastewater methane capture is a secondary priority of the initiative to slowing rampant deforestation. Moreover, compliance doesn’t take effect until 2020. For these reasons and more, greening supply chains can be tough, and for now buying certified sustainable palm oil is a slow way to catalyze biogas development. Still, as a recent essay in this magazine argues, targeting hot spot problems in just a few places globally can achieve substantial progress toward climate mitigation. Palm oil wastewater is one of those places. Taken together, the rise of regulatory frameworks, the eventual prospect for proper carbon valuation, and shifts in consumer and corporate partner behavior should start turning the tide. Philip Taylor is a postdoctoral fellow at the University of Colorado. Alan Townsend is a professor at the University of Colorado. This post originally appeared in Ensia.